Illegal wildlife trade is transnational organised crime with a significant financial element. Worldwide, for every wildlife product sourced illegally, money changes hands – whether in domestic pet stores, on online marketplaces or under the eyes of corrupt officials. The trade is, at its heart, criminality that exists for the enrichment of those who perpetrate it. Why does the financial sector need to be involved in IWT? There is consensus that money linked to illegal wildlife trade does not move only in cash – the global banking system is a crucial medium for the transfer of illicit proceeds. Thus, without including the risks linked to IWT, financial institutions risk acting as unwitting facilitators of the trade, with associated illicit financial flows continuing to move around the world through legitimate banking channels. Financial institutions have a crucial role to play in the fight against illegal wildlife trade. A number of governments worldwide have recognised the role of IWT in undermining security and rule of law, which has a direct impact on financial systems. It is also widely recognised that existing financial systems are often used to move the proceeds of IWT and to launder the funds gained from this criminal activity. How can the financial sector help? To effectively respond to illegal wildlife trade, there is growing awareness of the need to engage with financial institutions, to not only seek their help through the use of their existing infrastructure but to also use financial intelligence to support law enforcement efforts to pursue the trade’s greatest beneficiaries. By supporting this effort, financial institutions can make a tangible impact on a lucrative transnational crime, while meeting their legal obligations to actively monitor for and investigate suspicious activity. In response to the need to engage financial institutions in this effort and to identify specific actions that can be taken by the sector, a bank-led IWT Financial Taskforce has been established. Supported by technical experts including RUSI and TRAFFIC, along with a Secretariat, the Taskforce has been working to identify specific actions that the financial sector can take on this issue. Comprised of representatives from financial institutions as well as experts on illegal wildlife trade, the Taskforce will leverage the existing global financial crime architectures, as well as specific work already done by a number of financial institutions to support efforts to combat IWT. 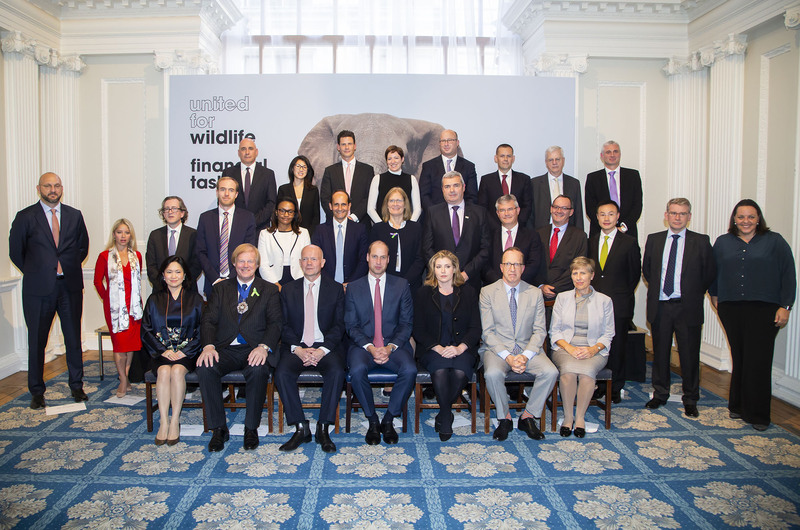 Convened by The Duke of Cambridge in October 2018, institutions signed the Mansion House Declaration as part of the Financial Taskforce, which lays out six commitments, including the dedication to share resources and intelligence in a bid to disrupt the illegal income generated by poached animal products such as elephant tusks, rhino horn and pangolin scales. Click here to see the full list of Financial Taskforce signatories and read the full declaration here.